The 49ers have released defensive tackle Ian Williams from the reserve/non-football injury list with an injury settlement, according to Adam Caplan of ESPN.com (Twitter link). Williams was placed on NFI in July while dealing with an ankle injury. Williams, 26, originally agreed to a five-year, $26MM deal with San Francisco in the early stages of free agency in March, but the same ankle ailment that ultimately landed him on NFI forced him to accept a reworked one-year contract worth only $4MM. He hasn’t been earning that full salary while on NFI, but the settlement will allow Williams to make a bit more money that he would have on NFI, as Matt Barrows of the Sacramento Bee writes. As such, the injury settlement doesn’t necessarily indicate that Williams suffered a setback in his recovery, per Barrows. Williams will now be allowed to hit free agency and search for deals with other clubs, but the 49ers remain interested in re-signing him after the season concludes. Under the league’s rules, Williams would have to wait three weeks plus the length of the settlement before re-upping with San Francisco. 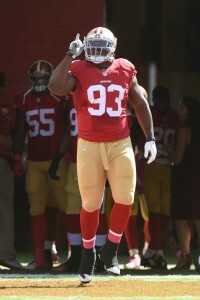 A former undrafted free agent, Williams had been with the Niners for the entirety of his career, serving as a reserve from 2011-13 and becoming a starter during Jim Harbaugh‘s final season. In 2015, Williams started started 16 games for the first time. A quality run defender, Williams made 65 tackles last season and ranked as one of Pro Football Focus’ top interior defensive linemen, grading as the No. 18 overall interior defender and a top-two 3-4 nose tackle. To clear space for the recently reinstated Anthony Davis on the 49ers’ roster, the team moved starting nose tackle Ian Williams to the NFI/reserve list, per Matt Maiocco of CSNBayArea.com (on Twitter). Williams is out for the season. Williams re-signed with the 49ers in March on a one-year, $4MM deal. The sides previously reached a five-year agreement worth more than $25MM, but the ankle injury that will shelve the sixth-year defensive lineman for the season helped induce the amended commitment. San Francisco planned on retaining Williams long-term, but his 2016 season being erased obviously clouds that future. It remains unknown how Williams injured his ankle this offseason, but that setback cost him millions and now could well send him back into the free agent market on the heels of a lost season. The former 49ers UDFA has been with the team throughout his career, serving as a reserve from 2011-13 and becoming a starter during Jim Harbaugh‘s final season. Under Jim Tomsula last year, the former Notre Dame lineman started 16 games for the first time. He was going to be a key part of the 49ers’ defense this season. However, the offseason ankle surgery the 26-year-old underwent changed those plans. A quality run defender, Williams made 65 tackles last season and ranked as one of Pro Football Focus’ top interior defensive linemen, with the analytics website tabbing him as its No. 18 overall interior defender and a top-two 3-4 nose tackle. The rebuilding 49ers are thin behind Williams, with Roster Resource showing the 49ers could be down to UDFAs and part-time contributors Mike Purcell and Tony Jerod-Eddie at nose now. MARCH 23, 3:09pm: Williams’ one-year deal is now official, having been announced by the 49ers in a press release. Per Matt Maiocco of CSNBayArea.com (Twitter link), GM Trent Baalke has said the Niners still plan to sign Williams to a long-term deal. However, that will obviously be dependent on his health. MARCH 21, 1:21pm: Nearly two weeks after the 49ers and Williams agreed to what was expected to be a five-year contract worth more than $25MM, the two sides have now struck a deal on a reworked agreement for just one year, tweets Matt Maiocco of CSNBayArea.com. According to Maiocco, Williams’ recovery from an ankle injury will take longer than initially planned, prompting the team to revisit the terms of the agreement before the deal became official. Adam Schefter of ESPN.com adds (via Twitter) that the defensive lineman underwent ankle surgery after the 2015 season, creating some uncertainty about his availability for the 2016 season opener. Per Aaron Wilson of the Houston Chronicle (Twitter link), Williams’ new one-year deal has a base value of $3MM, including a $1MM base salary and $2MM in per-game roster bonuses. Wilson says the deal features $2MM in playing-time incentives, while Schefter tweets than it can be worth up to $6MM in total. MARCH 9, 9:48am: Williams’ new five-year deal with the 49ers will be worth between $5MM and $6MM per year, tweets Rapoport. 7:16am: The 49ers have reached an agreement with one of their own free agents, according to Ian Rapoport of NFL.com, who reports (via Twitter) that the team is re-signing defensive tackle Ian Williams to a five-year contract. Coming off a leg injury that ended his 2014 season, Williams was a 16-game starter for the first time in 2015, and looked very good at nose tackle for the Niners, racking up 65 tackles and a sack. Pro Football Focus ranked Williams 18th out of 123 qualified interior defenders for the season, assigning him a particularly strong grade as a run defender. Re-signing Williams to a new deal represents a nice start for this Niners’ offseason, after the team saw a handful of core defenders – Patrick Willis, Justin Smith, and Chris Borland, among others – depart via retirement or free agency during last year’s offseason. While the team figures to pursue other additions on defense, the fact that Williams will return in the middle of the defensive line should provide some nice continuity as the defense transitions from Eric Mangini‘s system to Jim O’Neil‘s. Williams ranked as the 28th overall free agent on PFR’s top 50 list. If Von Miller were to reach the open market, he would likely be looking to become the NFL’s highest-paid defensive player, according to Jason Cole of Bleacher Report (video link), who points to Ndamukong Suh‘s six-year, $114MM deal with the Dolphins as the one Miller would like to match or exceed. As Cole notes, there would be plenty of teams with interest in the outside linebacker if he becomes an unrestricted free agent. However, the odds of Miller hitting the open market look pretty slim. Even though the Broncos have other key free agents that could be candidates for the franchise tag, including Brock Osweiler and Malik Jackson, Denver is expected to use that tag on its star pass rusher, says Cole. That doesn’t mean Miller won’t sign a long-term deal this offseason, but it would have to be either with the Broncos or with a team willing to give up two first-round picks to land him, so his leverage will be limited. The Cardinals‘ top priority this offseason will be improving their pass rush, and GM Bruce Arians said on Arizona Sports 98.7 that he doesn’t expect to make an impact addition in free agency, says Darren Urban of AZCardinals.com. That means that the team will likely target a pass rusher early on in the draft. Within his article, Urban notes that if a player like Miller were to avoid the franchise tag and reach free agency, it could change the Cardinals‘ stance. While that’s unlikely to happen, I wonder if Arizona might be willing to consider an offer sheet for the Broncos pass rusher even if he gets franchised — parting with two first-round selections wouldn’t be as significant a blow for a team like the Cardinals, whose first-rounders won’t be particularly high picks. Teams are typically hesitant to pursue other teams’ franchised players, not wanting to part with those picks, and I doubt the Cardinals would seriously go after Miller if he’s franchised. For a pass rusher of his caliber though, it’s at least worth considering. While the 49ers have the cap space and low payroll necessary to be very aggressive in free agency, Jason Fitzgerald of Over the Cap doesn’t expect the team to splurge in March. Within his preview of San Francisco’s offseason, Fitzgerald suggests it would make sense for the Niners to lock up defensive lineman Ian Williams to a three-year contract and cut linebacker Ahmad Brooks. For the second consecutive year, veteran NFL coach Mike Holmgren has expressed interest in the 49ers‘ head coaching job, a source tells Robert Klemko of TheMMQB.com (Twitter link). Holmgren said back in July that when he reached out to the Niners last winter, the team conveyed to him that it wanted someone younger. For Holmgren to get an opportunity in San Francisco, the club would have to change that stance, and would also have to part ways with current coach Jim Tomsula. Veteran pass rusher Dwight Freeney has been a terrific addition to the Cardinals‘ defense, but he said on Monday that he has “no clue” whether he’ll continue playing in 2016, per Alex Marvez of FOX Sports (Twitter link). Freeney intends to re-evaluate his future a month after his season ends. Seahawks head coach Pete Carroll suggested on Monday that running back Marshawn Lynch could be cleared to return to practice by Wednesday, which might put him in position to return to the field for Week 17 and the postseason (Twitter link). The 49ers have officially activated defensive tackle Glenn Dorsey to their 53-man roster, placing defensive tackle Ian Williams on injured reserve in a corresponding move, the team announced today (Twitter link). Head coach Jim Harbaugh had suggested earlier today that Dorsey would soon be activated. Dorsey has been sidelined for the entire 2014 season to date, having been placed on IR with the designation to return prior to Week 1 due to a biceps injury. Williams played well in Dorsey’s absence, but suffered a fracture in his leg during Week 10’s game against the Saints. Quinton Dial took over as the team’s nose tackle yesterday against the Giants, though according to Pro Football Focus, he played just 14 of 70 total defensive snaps. Assuming Dorsey is ready to see regular action on defense for the Niners, he’ll be the second key player to return to the unit in the last two weeks. Linebacker Aldon Smith was activated following his nine-game suspension last week, and made his season debut on Sunday in the Meadowlands. The Vikings front office has become very sensitive about bringing back running back Adrian Peterson following his prolonged legal saga, writes Jason La Canfora of CBSSports.com, who adds that there are “no guarantees” the club would welcome him back if he’s reinstated by the NFL. Citing multiple sources with knowledge of the situation, La Canfora writes that the Vikings harbor “serious concerns” about Peterson’s physical and mental state — while the running back accepted a no-contest plea, the team isn’t sure he recognized the seriousness of the charges he was facing. La Canfora also hears from sources that Peterson isn’t currently in game shape. As we wait to see what the NFL and the Vikings decide to do with the former All-Pro running back, let’s check in on several other items from around the league…. The Vikings should cut Peterson and let another team deal with the circus surrounding his return, argues Tom Powers of the St. Paul Pioneer Press. 49ers nose tackle Ian Williams suffered what head coach Jim Harbaugh called a “small fracture” in his left leg today, as Eric Branch of the San Francisco Chronicle details. The team’s regular nose tackle, Glenn Dorsey, is on track to return soon from off the injured reserve list, but if he’s not quite ready yet, Quinton Dial figures to get the start next week. According to Jason La Canfora of CBSSports.com (via Twitter), Carson Palmer‘s new extension features $10MM in guaranteed signing and roster bonuses, as well as a $10.5MM salary for 2015 that’s guaranteed for injury. So even though he may have torn his ACL today, the Cardinals quarterback has secured $20.5MM in guarantees over the course of this year and next year. Giants running back Michael Cox was in a wheelchair with what appeared to be a serious leg injury following the team’s loss in Seattle today, according to Dan Graziano of ESPN.com, who tweets that the club is likely to add a replacement running back this week. The Giants confirmed tonight that Cox fractured the lower part of his left leg, tweets Ralph Vacchiano of the New York Daily News. Lions offensive lineman Larry Warford doesn’t have an ACL injury, a source tells Jason Cole of Bleacher Report (Twitter link). Warford will undergo further tests to determine the severity of his knee injury. Jeremy Maclin bet big on himself when he turned down a multiyear contract offer from the Eagles in the offseason to sign a one-year deal, and that decision is paying off, writes Bob Ford of the Philadelphia Inquirer.